Once a production order has been created it can go through several steps before it gets built and received to inventory. Click on add or edit to open a production order. Save – Saves the production order. Save/Close – Saves and closes the production order. Print – Prints Production Order. 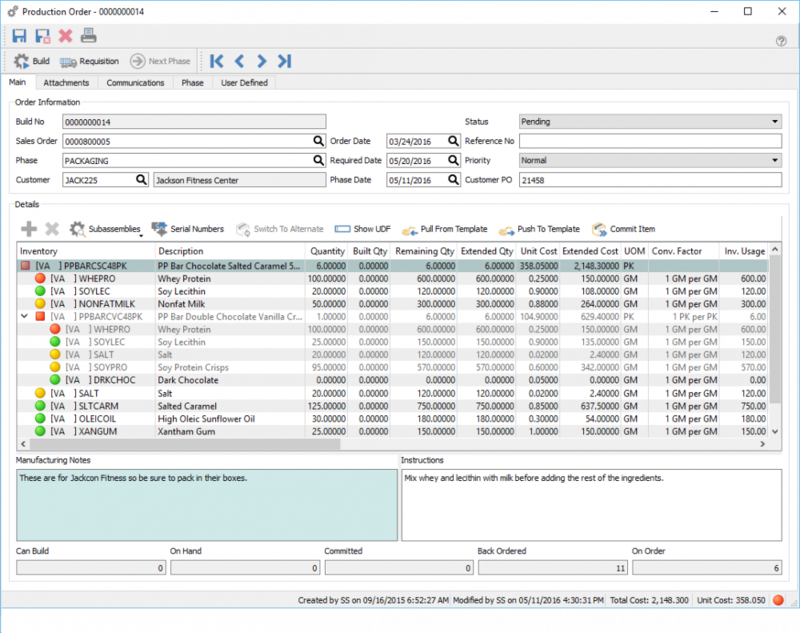 Build – Builds Production Order to receive the finished product using the total component cost, and relieves the components from inventory. Requisition – Requisition shortages for Production Order. Next Phase – Pushes the production order in the next phase in the sequence. Navigation – Moves from order to order in the sale order that the list is in. Attachments – Can add any number of attachments to the production order. Double clicking the attachment will open it with its default viewer. Communications – Any number of notes can be added. User Defined – User defined fields can be added to the production order to track info that Spire does not have by default. Build No – The number assigned to this production order coming from the next number in the sequence taken from Company Setting/Sequence/Production. Sales Order – The sales order number that this production order is from. This can be manually entered or come from sales order requisitions. Customer – The customer that this production order is for. It can be added manually or it can come from sales orders when a user requisitions a manufactured item. Required. Date – The date that is required fore this production order to be completed. This date is either added manually or will come from the required date of a sales order requisition. Customer PO – The customers purchase order number. Add – Adds a component or sub-assembly line. Delete Deletes a component or sub-assembly line. Sub Assemblies – Allows the user to toggle sub-assemblies on or off and to expand all available sub-assemblies. *A sub-assembly is indicated by a square dot on the detail line instead of a round one. !When sub-assemblies have the arrow in front of them and the production order gets built, it will consume the components of the sub-assemblies and NOT a finished sub-assembly. Serial Numbers – Used to select serial or lot numbers of the components. Switch to Alternate – If an item is short as indicated by a red or yellow dot, clicking this button on a detail line will switch the item for its alternative as set in inventory edit. Pull From Template – Used to pull the components onto the production order from the template indicated on the top assembly item. Push To Template – Pushes changes on this production order back to the template from which this order was derived. Commit Item – Commits the components in inventory for the selected line of the order. Inventory – The item being built on the top, and the components and sub-assemblies beneath it. Description – The description of the items. Quantity – The quantity of the finished item on top and the quantities of components and sub-assemblies that will be consumed beneath it. Built Qty – The quantity of the top item that have been built so far and quantity of components and sub-assemblies that have been consumed so far. Remaining Qty – Now many still left to build and consume. Extended Qty – Extended quantity of components calculated by the total to be built times the quantity of the component. Unit Cost – The cost of the top item is the sum of the components cost, The component cost comes from the inventory cost. UOM – The unit of measure being built and consumed. Conv. Factor The conversion factor for the unit of measure. Inv. Usage – The inventory usage is calculated by (quantity being built) X (Component quantity) X (UOM conversion factor). Lead – The lead time from the supplier. Vendor No – The vendor the component is usually purchased from. Category – The category for the top and components. This is just used for reporting. Exp. Yield% – The expected yield for this top item. Exp. Scrap% – The expected scrap for this component. Exp. Scrap Qty – The expected scrap quantity for this component. Act. Scrap Qty – The actual scrap quantity for this component. This is usually edited just before building the production order. Assemble Qty – The quantity to assemble based on yield. Assembled Qty – The top item quantity that was built based on yield. Date – The date the line was committed. Employee Name – The employee name selected above. Requisition No – The purchase order or sales order the requisition came from. Template – The template from which this order came from. If blank it was created manually as a custom order. Revision – The revision number of the template.